The websites creator or author is CertifiedFinancialPlanning.net. Copyright © - 2007 CertifiedFinancialPlanning.net - All Rights Reserved is the owner of the copyright for this website. 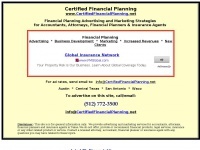 The web server used by Certifiedfinancialplanning.net is located in Houston, USA and is run by CyrusOne LLC. On this web server 59 other websites are hosted. The language of those websites is mostly english. Only a few websites on this web server are x-rated. A Nginx server hosts the websites of Certifiedfinancialplanning.net. Indexing the data of the website and following hyperlinks on it is explicitly allowed by robot information. The website contains advertising by Google Adsense.